U.S. Congressional delegation at the An1tkabir Mausoleum. "The successful conclusion of this visit highlights one of the core missions of our organization," stated G. Lincoln McCurdy, TCA President. "We believe that America’s leaders need to have first-hand knowledge of Turkey and the region in order to make responsible decisions for American foreign policy. There is simply no substitute for direct exposure to a country and it’s peoples in order to foster understanding and cooperation today and in the future." "TCA is honored to have been granted the opportunity to highlight ever-strengthening areas of US - Turkish partnership, particularly their collaborative efforts in the Balkan region. We anticipate that in the tradition of previous participants that these delegates will return to their offices better informed of the more than six decades of strategic ties between the United States and Turkey and better equipped to assist their respective members in fostering current and future relations between the two nations." During their time in Turkey, the delegation met with religious and secular community leaders, scholars from various think tanks, NGO representatives, academics, members of the press, and Turkish business community leaders. 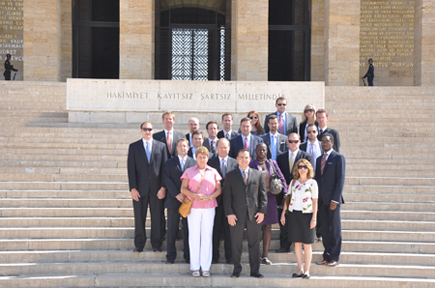 The delegation also visited the historical World War I battlefield of Gallipoli and the Canakkale (Dardanelles) straits, as well as the legendary site of Troy. In Ankara, the delegation met with Doug Silliman, Charge d’Affairs of the US Embassy, and Ambassador Selim Yenel, Deputy Undersecretary of the Ministry of Foreign Affairs. In his remarks to the delegation, Silliman stressed Turkey’s strategic importance and underlined that the country is involved in eight of the United States’ nine top foreign policy issues. He said that the relationship had its high points and low points through its history, and that both sides needed to continue to work hard to strengthen it and remain in close dialogue on issues of shared significance. The meeting with Ambassador Yenel gave the delegation a chance to engage in a discussion on Iran, relations with Israel, and other regional issues. Ambassador Yenel highlighted that Turkey's efforts to mediate neighbors' conflicts stems from a wish to bring about regional stability and peace, not to take on a neo-Ottoman role. Ambassador Yenel underscored that while Turkey and the United States differ on their foreign policy approach, they ultimately desire the same stability and prosperity in the region and the world. He also expressed his confidence that while relations with Israel were at a low point today, that they will eventually be restored and strengthened to the benefit of both countries. “We believe the visit came at a significant time in US-Turkey relations and has helped to enhance mutual dialogue and understanding about opportunities and challenges on issues of critical importance to both nations,” said Basak Kizildemir, TCA’s Vice President in Turkey.